For many people, an addiction to alcohol can be something of a surprise. It’s not an immediate thing, but builds over time. This is one of the main problems with the insidiousness of alcohol addiction. Sometimes it’s difficult to see the signs before it’s too late. So how can you recognize whether or not you or a loved one might have become addicted to drinking alcohol? Read on to see if you can relate to any of these 5 warning signs. If you drink by yourself, this can be a warning sign that something’s wrong. This doesn’t mean that you have a beer at your house occasionally when no one’s around, but getting extremely drunk when you’re alone. If you’re drinking in secret and hiding it from others, that means there’s a problem. It’s clear that there’s an issue, even to you, otherwise you wouldn’t go out of your way to hide it. Addiction to alcohol can also take the joy out of other activities. This means that you only feel happy when you can get a drink, or when you’re participating in activities that involve drinking. 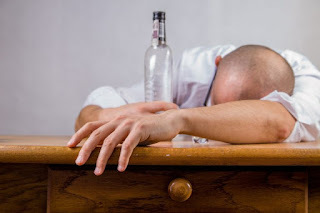 It also means that an addiction to alcohol can cause depression, which is one of the reasons people lose interest in their favorite activities. Alcohol is a depressant and while it initially offers a ‘buzz’, it can lead to depression.